2018 – CELEBRATING ILLINOIS’ 200TH BIRTHDAY! 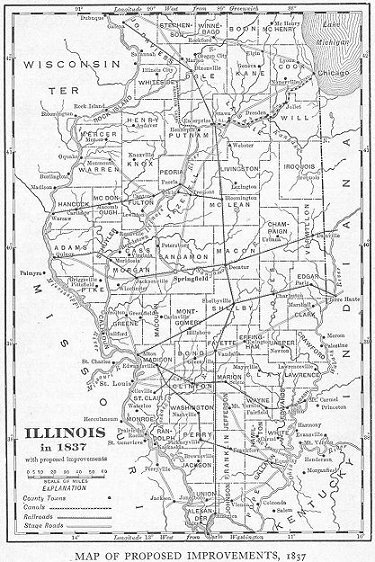 Logan County was formed February 15, 1839, from Sangamon County by an act of the Illinois General Assembly. In 1841 Logan gained more land from Tazewell County. In 1847 a small part of DeWitt County became part of Logan County, completing the county boundaries as we know them today. The county was named by Abraham Lincoln, a member of the General Assembly at the time and the prime mover in forming the county, in honor of his friend Dr. John Logan, a well known Illinois pioneer and fellow member of the Illinois General Assembly. Dr. Logan, the father of Civil War General John A. Logan, was a resident of Murphysboro. He was not from Logan County. Logan County covers approximately 618 square miles of central Illinois. Lincoln is the third and current county seat. Earlier county seats were Postville, later known as Camden, 1839-47, and Mt. Pulaski, 1847-53. The actual Postville courthouse is at the Henry Ford Museum in Michigan but a reproduction exists in Lincoln. The Mt. Pulaski courthouse, where Lincoln practiced law on the Eighth Judicial Circuit, still stands on the square in that town. It is one of only two still existing courthouses where Lincoln actually practiced law on the circuit. Shortly after the records were moved from Mt. Pulaski, the first courthouse in Lincoln burnt [April 15, 1857] destroying all the records that were housed there. Generally, records from the period before the fire Logan became a county in 1839 may be found at the State Archives or at IRAD in Springfield under Sangamon County. The records for 1839-1857 stored in the courthouse were lost. Federal land purchase records were not in the courthouse and still exist. Some deeds and other documents were brought in by the public after the fire. Thus some records for that period may show up in abstracts or legal files. The Logan County Genealogical & Historical Society has reconstructed early probate records using historical newspapers. If you don’t find who or what you are seeking using the search engine please click HERE for further assistance. NEW: Search all of ILGenWeb – Click Here. SEARCH Logan County Probate Records Browse the images which are filed by year and with an alphabetical index book. In addition to the links below, FamilySearch has indexed all censuses as well as the 1855 and 1865 Illinois state censuses. Images may be on FamilySearch or a partner paysite. All the links below are free. The Logan County mailing list is maintained at Rootsweb. They have a new system. Subscribe to this list by sending an email or visiting the administration page for this list (requires separate login). After subscribing, you should receive a confirmation email. Follow the instructions in that email. If you do not receive it, your subscription request may be waiting for the list administrator to approve, or it may be in your junk or spam mail folder. Note that for subscribing to the list digest, you will need to visit the administration page. Unsubscribe to this list by sending an email or visiting the administration page for this list (requires separate login). You should receive a confirmation email. Follow the instructions in that email. If you do not receive it, check your junk or spam mail folder. You may browse or search the archives for this list. For questions about this list, contact the list administrator at [email protected].